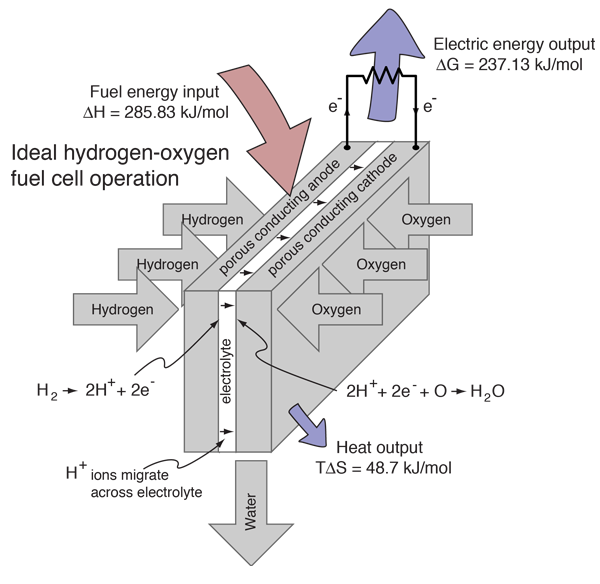 By providing energy from a battery, water (H2O) can be dissociated into the diatomic molecules of hydrogen (H2) and oxygen (O2). This process is a good example of the the application of the four thermodynamic potentials. The electrolysis of one mole of water produces a mole of hydrogen gas and a half-mole of oxygen gas in their normal diatomic forms. A detailed analysis of the process makes use of the thermodyamic potentials and the first law of thermodynamics. This process is presumed to be at 298K and one atmosphere pressure, and the relevant values are taken from a table of thermodynamic properties. Since the electrolysis process results in an increase in entropy, the environment "helps" the process by contributing the amount TΔS. The utility of the Gibbs free energy is that it tells you what amount of energy in other forms must be supplied to get the process to proceed. Hydrogen and oxygen can be combined in a fuel cell to produce electrical energy. 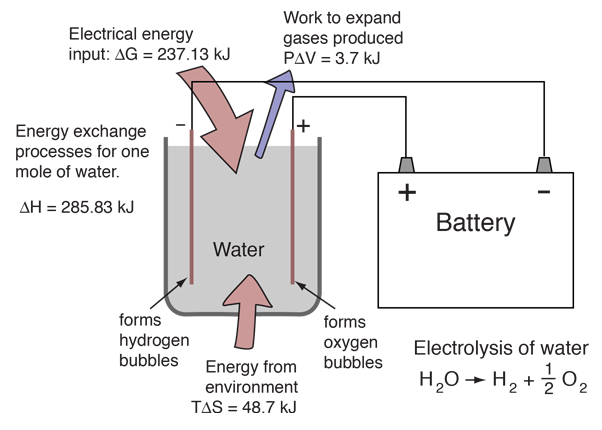 A fuel cell uses a chemical reaction to provide an external voltage, as does a battery, but differs from a battery in that the fuel is continually supplied in the form of hydrogen and oxygen gas. It can produce electrical energy at a higher efficiency than just burning the hydrogen to produce heat to drive a generator because it is not subject to the thermal bottleneck from the second law of thermodynamics. It's only product is water, so it is pollution-free. All these features have led to periodic great excitement about its potential, but we are still in the process of developing that potential as a pollution-free, efficient energy source (see Kartha and Grimes). Note that when the descriptor "efficient energy source" is used here, it just refers to the relative efficiency with which the energy is applied to a task, not that it is the ultimate source of that energy. The fuel cell does not generate energy, but just transforms the energy contained in the hydrogen and oxygen fuel to a useful electrical energy output. The overall practicality of fuel cells depends upon the efficiency of the process of producing the hydrogen and oxygen fuels which power the cells. Getting the hydrogen and oxygen fuels from other, more primary, sources of energy has proved to be the limitation on the application of fuel cells. If solar or wind energy could be efficiently used to electrolyze water, the practicality of fuel cells would be enhanced. Combining a mole of hydrogen gas and a half-mole of oxygen gas from their normal diatomic forms produces a mole of water. A detailed analysis of the process makes use of the thermodynamic potentials. This process is presumed to be at 298K and one atmosphere pressure, and the relevant values are taken from a table of thermodynamic properties. For this ideal case, the fuel energy is converted to electrical energy at an efficiency of 237.1/285.8 x100% = 83%! This is far greater than the ideal efficiency of a generating facility which burned the hydrogen and used the heat to power a generator! Although real fuel cells do not approach that ideal efficiency, they are still much more efficient than any electric power plant which burns a fuel. In comparing the fuel cell process to its reverse reaction, electrolysis of water, it is useful treat the enthalpy change as the overall energy change. The Gibbs free energy is that which you actually have to supply if you want to drive a reaction, or the amount that you can actually get out if the reaction is working for you. So in the electrolysis/fuel cell pair where the enthalpy change is 285.8 kJ, you have to put in 237 kJ of energy to drive electrolysis and the heat from the environment will contribute TΔS=48.7 kJ to help you. Going the other way in the fuel cell, you can get out the 237 kJ as electric energy, but have to dump TΔS = 48.7 kJ to the environment.